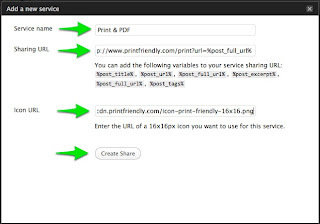 Now you can add the one-and-only Print Friendly & PDF button to your WordPress.com website! PrintFriendly makes your website look great when printed, and saves paper and ink. It cleans and optimizes webpages before printing, plus you can remove-images, change text-size, and save as PDF. 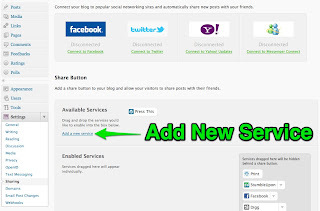 It's free, and easy to add to WordPress.com. Learn more about Print Friendly & PDF. These instructions are for WordPress.com, not to be confused with WordPress.org. If you're using WordPress.org for self-hosted and hosted WordPress sites, you can get the PrintFriendly Plugin for WordPress.org. 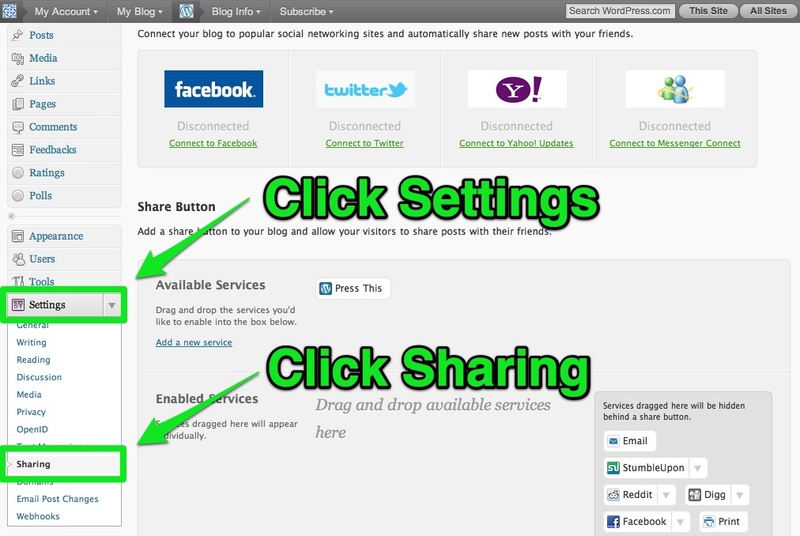 From Your Dashboard, click "Settings", then click "Sharing". 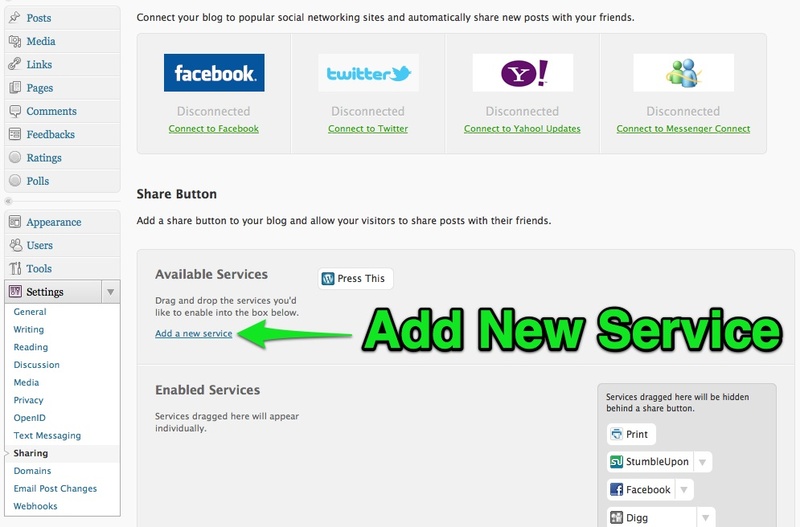 From the Sharing Settings, click "Add a new Service". 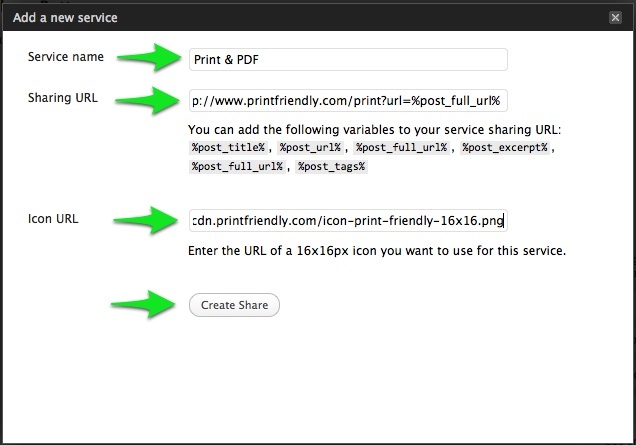 Step 3: Drag-and-Drop Print Friendly Button to "Enabled Services"
Left-Click (and hold) the new Print & PDF button. 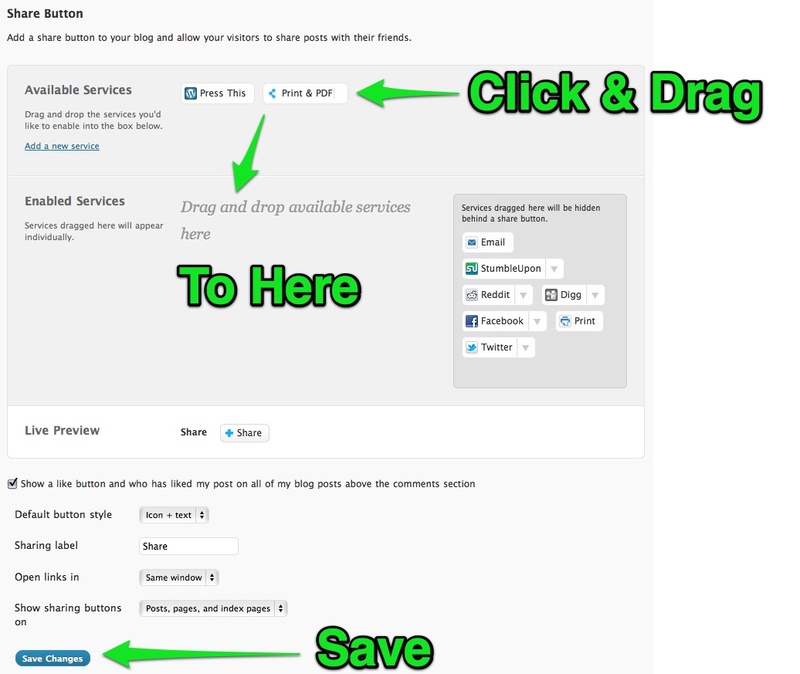 Drag to "Enabled Services", and release the mouse button. Don't forget to save! That's it! You should see the Print & PDF button on the bottom of every post. I was wondering if there's anyway you can select the pages in which you want the button to appear. (or the opposite: if you do not want the button to appear on certain pages.) THANKS! Thanks, very helpful! I really like the services of the Print Friendly and this is of great value to my blog! I recently implemented this into my own blog. At first I was about to put it at the bottom of every page on my site, but realizing it's optimized for articles and posts, I put it on my blog instead. You got that right. The button works best on articles or news pages. Great tool. Any way I can create a PDF of a single page on my website? I use Wordpress to maintain a website rather than a blog, so I don't need the capability to print posts, just a single web article. Thanks. You can just use the PrintFriendly button on posts as well. Just install PrintFriendly plugin on your WordPress installation and make sure you make the button visible on both posts & pages from the settings page. is it possible to print the post's comments as well as the post? As of now, you cannot include the comments in the print. Great tool. But I need it to reduce the font size to 50% instead of the 70% that is listed. How/Where would I find to do that in the JS to change? Thanks ahead of time. Hi, This article will come in handy for you. Thanks. Please contact support if you have questions. Hi Francisco, I have just added your website's link to the list for reviewing. Our developers will soon look into it for issues. I apologize deeply for the problem. I have alerted our developers of these URLs and they will be working on it as soon as possible. Am using your printer friendly plugin for wordpress on my website. It is working fine i chrome and firefox. But on IE it is showing a error. An error has occurred. We've been alerted to the error and will do our best to get it fixed. So can you please let me know the fix for this. Is this error occurring all the time with all the posts? Please give me the URL so that I can check. Can you give us your site URL? Perhaps email it to support@printfriendly.com for a better support. We'll see what's causing the problem. I am trying to get Printfriendly to work on my blog peterurbani@wordpress.com but all it does is print the title and does not pick up the embedded ExcelOnline file I actually wish to print. Any thoughts ? PrintFriendly at this point does not support embedded content, that is why your embedded ExcelOnline file is not being picked up by PrintFriendly. Is there any way to get the plugin to include the featured image? If the featured image is visible in the actual content area, then the image should automatically be picked up by PrintFriendly. If not, then there is no way to get that to show in PrintFriendly. is there any way to reduce the url link for wp-print plugin in word press? Hi, I'm not sure I understand what the issue is. Can you tell a bit in details and send an email to support@printfriendly.com? 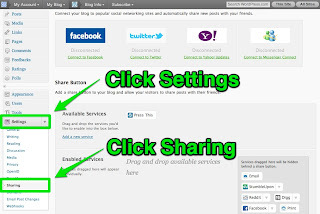 Make sure to include a link to your site.